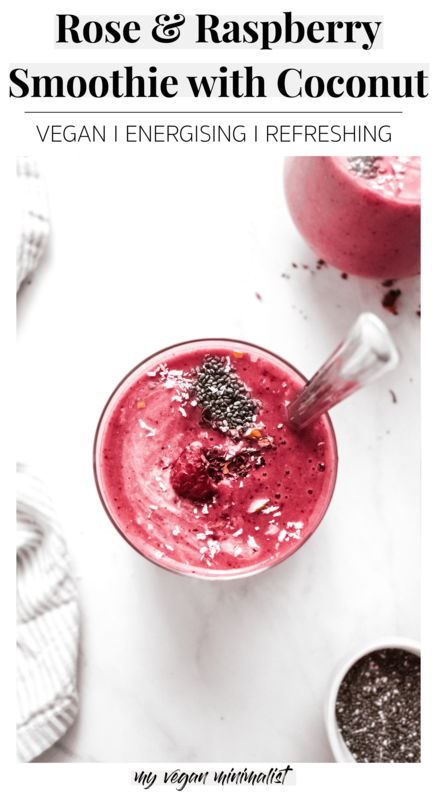 Rose and raspberry smoothie to keep you energised! This beautiful smoothie is packed with vitamins. Luxuriously rich, yet only requiring basic ingredients. The perfect breakfast on-the-go or post-workout treat. Developing smoothies is a lot like developing oatmeal recipes. It’s best to provide exact guidelines that serve as a great base, but ultimately, you need to allow a certain degree of customisation. 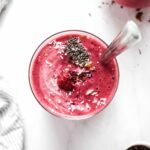 There’s people that want their fruit smoothies as thick as milkshakes and then there’s the exact opposite – lovers of runnier smoothies with a juice-like consistency. I want you to keep this in mind when you make your next smoothie. Don’t be afraid to improvise and stick to what works best for you. That might be adding an extra bit of plant-based milk, adding more water or even chucking in a few ice cubes. I love the fact that this is a low-cost smoothie that only requires very basic vegan ingredients. 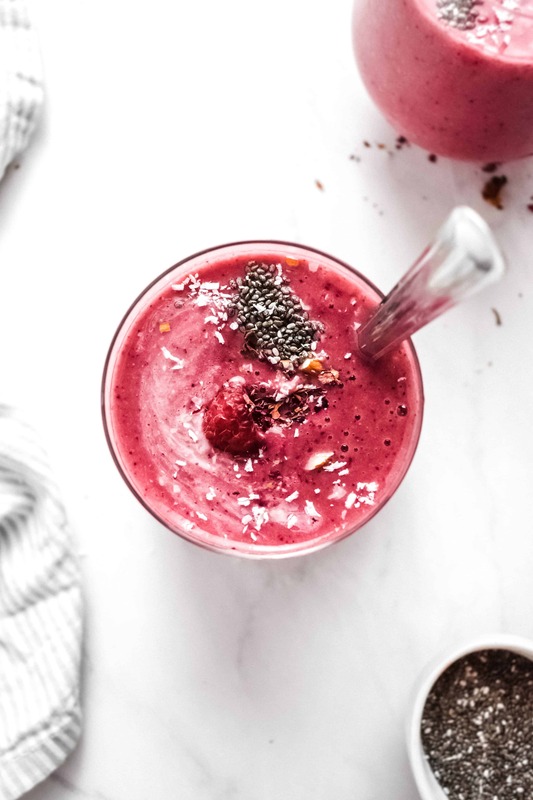 Perfectly ripe bananas, almond milk and frozen raspberries are at the core of this vegan fruit smoothie. And what’s best, they also happen to be the basic everyday staples of many vegan pantries! Looking for more delicious vegan drinks? Check out my refreshing cranberry mocktail or warm up with a cup of rose hot chocolate. 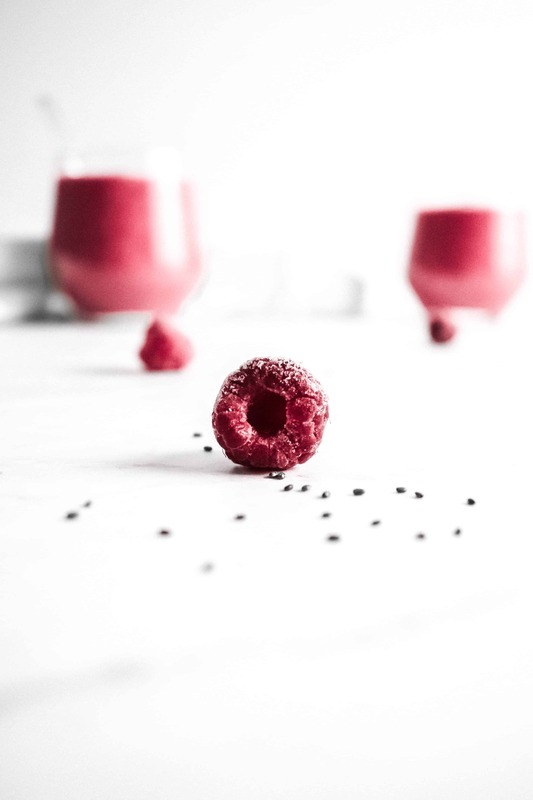 This raspberry smoothie is best enjoyed fresh, but you could store it in an airtight container for roughly a day. If you’ve made a large batch and are unable to drink it up all in one go, a fun tip is to pour it into an ice cube tray and freeze it. Not only does that make a fun, bite-sized snack, it also helps preserve it for a longer period of time, as you can easily defrost it. Combine all your ingredients (except toppings) and blend at high speed for 1 minute. Top off with coconut, chia seeds and rose petals.